Part of improving while training in any martial art is about enhancing your skills with the help of training equipment. Kung fu is no different. Aside from the must have Wing Chun dummy, there’s a lot of kung fu training equipment out there. Let’s take a look at some of the most useful items. An an extremely usefully and very affordable piece of kung fu training equipment is the kung fu wall mounted striking bag. 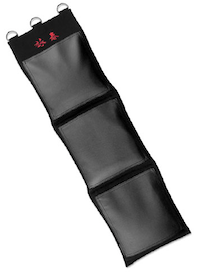 These bags are used most by Wing Chun practitioners but are a common piece of training gear for Iron Palm training as well, regardless of the martial arts discipline. Most of the bags are made of either genuine leather, synthetic leather, or canvas. The benefits of using a leather bag are that it’s a little easier on your skin, but they are known for not having very long life spans. Canvas kung fu wall striking bags last almost forever. They are much rougher on your skin than the leather models, but I actually think that’s a bonus. We are trying to toughen ourselves up with this piece of kung fu training equipment anyway, aren’t we? One thing that you should be aware of is that these bags almost never come filled. That’s actually a good thing as it saves you a ton of money on shipping fees. They are pretty easy to fill. If you are are beginner you’ll probably want to just go the traditional route and fill it with rice. More advanced students may use harder materials, but you will want to build up to that slowly and over time. The other thing to pay attention to when buying one of these bags is to make sure you get the size that you want. They usually come as either a single section or a three-section bag. As you can probably guess, the single section bag is for using your hands and elbows whereas the three-section bag allows for kicks. I prefer the three-section style, but there’s nothing wrong with single section bags. Don’t let the name fool you. These do not have to actually be made of iron. They can be made from brass and steel too. In fact, they don’t even have to be metal. Some rings are made from rattan. Kung fu rings are another useful piece of training equipment. The main purpose of them is to add extra weight to your arms and legs, thus improving your strength while training. The idea isn’t all that different from athletes using ankle weights. They also help toughen up the skin and soft tissue around the areas where you wear them. That is something that velcro style weight accessories cannot claim. If you’ve never used them, you will be surprised at how much something so simple can add to your training regiment. Remember, training is a lifelong commitment, and every little extra effort you put in adds up in the long run.